Summer 2002 | His Kids Too! 3) sharing the love of God to orphans, widows, etc., via providing food, medicine, clothing, toiletries, etc. Goals Met: All goals were met, and even more!!!! Thanks be to God! Because we want to be the best stewards the gifts so many of you have provided and funds you have sacrificially donated, below I will give some highlights of the trip followed by a more inclusive list of what was provided to each facility. Our family arrived in Kiev June 20, and were off to the train, to the Oblast. The week of June 24 was just great, and the 2 Bible camps went very well. Children and facility directors were thrilled with the curriculum, Bibles, crafts, songs, and the enthusiasm of the team members. All was well received, and they are eagerly awaiting next years program. His Kids, Too! has been working at the local internot for a while. This facility is not only a school for over 475 children, but home for up to 100 orphans. For the Bible camp, we were able to provide each child with new socks, sandals, bars of soap, toothbrushes, a large amount of play equipment, a Bible for each child, and school supplies. Medical supplies were left with the director for the entire facility. After the Bible camp, the team moved on to Kiev for a singing school, but we remained in the Oblast for 3 weeks. During this time we were able to accomplish many of the goals and objectives of His Kids, Too!. Life in Ukraine is difficult, and this trip was no exception. But God blessed us with great lodging, food and all our needs… remember I said, ‘needs’, not wants :-). Of course seeing and visiting with our dear friends was a complete joy! Many days were spent visiting facilities and assess the needs, purchasing items and returning for delivery. Some days were spent delivering the items we hand carried from the states. Medical equipment unavailable in Ukraine, but life changing to many precious children. One day we were off to the Children’s Orthopedic Hospital. The director there is wonderful, and very gracious and welcoming. 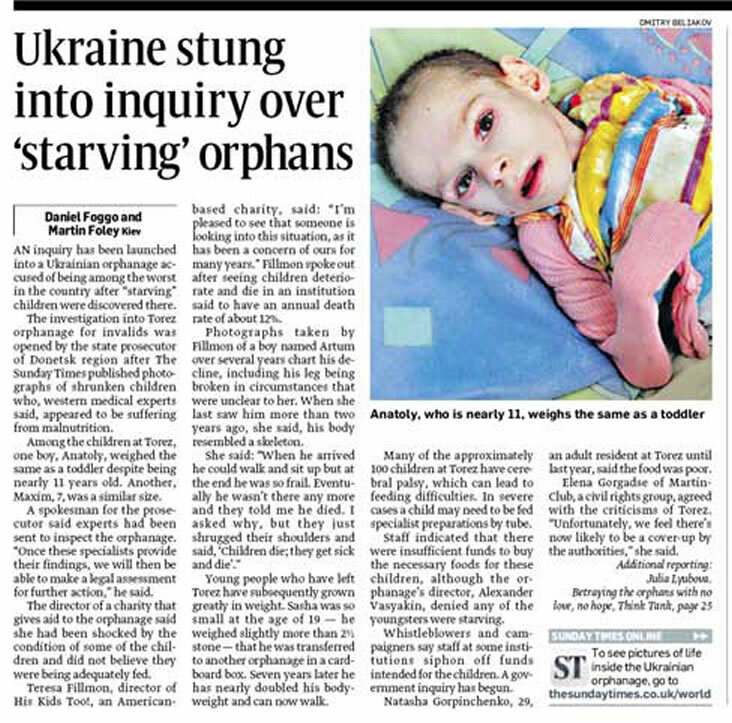 The children are in great need of so many things, that unfortunately Ukraine just cannot provide. We had the tearful experience of seeing children walk who had never walked before, with the aide of the walkers provided by Whitmyer Biomechanix, Inc. (www.whitbio.com), and Joe and Annette Northrup. Video footage of this will soon be on the sight. His Kids, Too!, with the donation, from Whitmyer Biomechanix of 7 (but only 2 went on this trip) wheelchairs, saw children, once tied to chairs, placed in a wheelchair for new found freedom. The children were so excited to receive these life changing gifts. Truly words cannot express the joy we felt by watching their faces ‘light up’! The orthopedic equipment for this facility was very appreciated and in the coming trips, I will deliver at least one more wheelchair per trip. These chairs are the property of the facility, for use (borrow) by the parents. One day was spent driving to another city, to distribute aide to an orphanage. The orphanage welcomed us with open arms, though the director was gone on vacation. The head Doctor, and friend to His Kids, Too! warmly received our gifts of clothing, medicine, walkers, and orthopedic equipment. We already provide diapers and high vitamin juice for this facility so they know we are accountable to our word, when they have a need to will do our best to provide for the children. A need was expressed for help with a child with orthopedic problems, and we delivered, thanks to the Northrups. We had the opportunity to witness a child without feet receive prosthetics (thanks to Medishare, Gainesville, FL), and this same child draw pictures with the aide of orthopedic equipment, thanks to the Northrup’s. Video footage will soon be on the sight with her walking and writing! Needless to say, many tears were shed and the facility staff were thrilled at these gifts. Each visit to each facility brought new and different experiences, since each facility has differing needs. The Specialized Baby Home was happy to receive crib mobiles, walkers, clothing, medicine, and wonderful crib liners (thank you, Zula McLeod). The babies were entranced by the musical mobiles and laughed and smiled as they played their tunes. All the His Kids, Too! staff members and volunteers thoroughly enjoyed playing and holding the babies, giving each special attention. Another local orphanage we were able to visit several times. Bringing gifts of clothing, new sandals for all the children, ball caps (thank you Embroidered Apparel), medicine, sport equipment, a toy for each child, toothbrushes, and some Bibles; the children were very happy with their ‘presents’, and the director was equally happy for them. For the local mental hospital we continue to provide sheets and pillowcases, clothing, soap and food, as this is a great need for them. This facility continues to house 30 male and 30 female, and the head Doctor appreciates any assistance. They still have a need of a consistent food supply, which we are working on. Additionally we were able to supply 30 widows with food and toiletries in wonderful canvas bags provided by Florida Children’s Forum. During our stay, 5 or 7 nights weekly, we had evening Bible study. Topics ranged from, Child Rearing, Sowing Seeds, Marriage Problems, Love, and Servanthood. There were both men and woman classes, with Rich teaching the men, and myself teaching the ladies. Average attendance for ladies classes was 20 per evening. During the first week in Ukraine, we had the joy of seeing 2 young people become Christians, Ola and Alexy. It was truly a blessing to see these young people make a decision to follow Christ. When our time in Ukraine was over, and we believe that it was time well spent. God had blessed the trip, and were able to meet our goals. Please remember, that each ‘gift’ is given with a laminated card stating that the gift is from the local Church, it’s meeting place and time, and a local contact person. Below is the list of items purchased and the aid that was distributed to orphans, hospitals, boarding schools, the mental hospital and specialized baby home. 200 sheet and pillowcases – these were provided as a thank you gift for the care they gave our friend, Oleg, and fellow servant for the Lord during his illness this past winter, and subsequent death. The trip was wonderful, productive and successful in meeting our goals. An added plus was that 5 of our 6 board members were all together distributing the humanitarian aide. I will return to Ukraine in October for a few weeks for humanitarian purposes as well as to continue to serve at the local church. We want to thank you for your continued support through prayers, encouragement and financial gifts to this ministry. Without your help, His Kids, Too! could not help these deserving people, and the seeds of Gods love for them could not have been sown. Please feel free to contact me with any questions or comments and may God Bless you as you serve Him. Teresa and the rest of the Fillmons!